Where does sleep fit into human lives? If our bodies went without oxygen, we live for approximately 3 minutes. Without water and depending on the climate it’s about 5 days. No sleep at all is third. We cannot live for more than approximately 11 days without sleep. Who would have thought that it was number 3, even way ahead of food! So you can see the importance of where sleep fits into our very existence. There are three pillars of health: DIET and EXERCISE and SLEEP. Consider a towering building. What is the most important feature? Of course it is the foundation! Without a foundation you cannot begin to build. 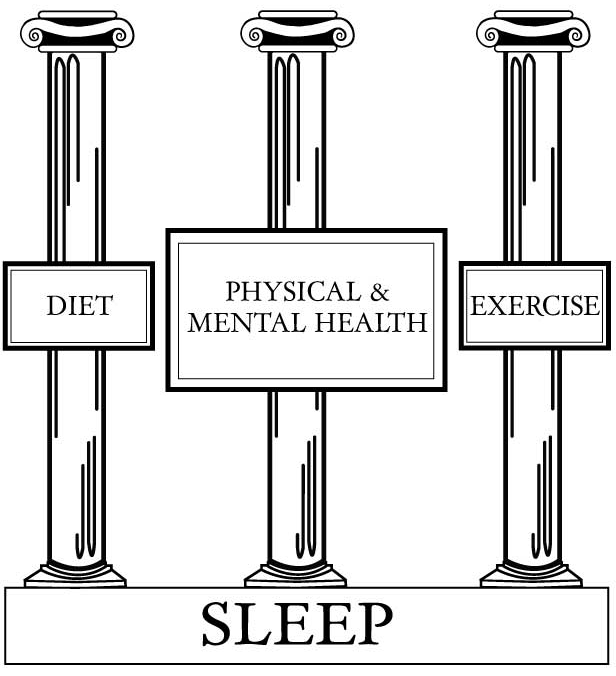 Like the building, diet and exercise and physical and mental health all sit on the foundation of sleep. Not just ordinary sleep but good quality and sufficient duration of sleep. Without good quality or enough sleep we cannot control our diet and weight management. Exercise is too exhausting and our physical and mental health deteriorates. Sleep is a very active process. A common misconception is that sleep is a time for being motionless when the body in general and the brain specifically shuts down for rest. It is totally understandable that one would conclude this because sleep is defined as being disengaged from the environment, unresponsive and unaware of ones surroundings. In fact during sleep things turn on. It is a very complex system which requires an immense amount of brain activity to control it. However, it can be very easily corrupted by many ‘human’ activities such as work related commitments, social events and media interventions. Once chronic sleep disruption occurs, it can be very hard to regain. Under-diagnosing individuals can become a community problem which can have dramatic effects on individual health and public safety. By not diagnosing or putting enough emphasis on the importance of quality sleep, can lead to the increase the decline of individual’s health from a wide range of co-morbidities caused by untreated OSA, heavy snoring and long term sleep loss, including metabolic, cardiovascular and cerebral consequences. Public safety is also at risk by those who are excessively tired due to sleep disorders. It has been researched that poor sleep can cause workplace accidents and more commonly vehicle accidents through the decline of driving skills whilst tired. Tiredness to the point where it is dangerous to drive, usually goes un-noticed by drivers in general, which according to research, is a major cause of traffic accidents. The public health burden of chronic sleep loss and sleep disorders is immense. Although clinical and scientific progress to help alleviate this problem is out there and expanding, professional help is low, considering the enormity of what is best described as an epidemic. 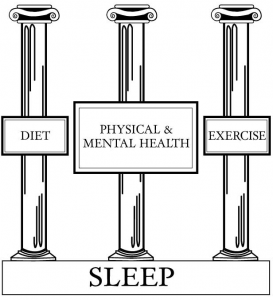 Sleep education in the general public is vital for preventing individual health crisis’ and the risk to public safety. Most people, even those in the medical field, have no formal training in sleep medicine, therefore the flow-on effect is that the general public have not been informed about the importance of sleep and cannot differentiate what is normal sleep and what is abnormal sleep. Disrupted sleep, inadequate sleep duration, daytime fatigue, excessive sleepiness and irritability are highly prevalent (20%-35%) in the Australian population. This is largely due to poor sleep habits or choices that limit sleep opportunity, however half the sleep problems are attributable to specific sleep disorders. Obstructive sleep apnea (OSA) is by far the most damaging sleep disorders for an individual in respect to health. 25% of adult males and 10% adult females are affected although most affected individuals do not complain of daytime sleepiness. OSA is a condition characterised by repetitive occlusions of the upper airway during sleep, resulting in snoring and the cessation of breathing, resulting in arousals and sleep fragmentation. It impacts on daytime vigilance and contributes to dysfunction and mood disorders. It is a source of lost productivity in the workplace and increases in motor vehicle accident risk. Some may show signs of poor progress, declination of social activities and sleeping at home outside of normal nocturnal sleep times. OSA has also been implicated as a cause of hypertension. Severe OSA is strongly associated with increased mortality, metabolic consequences, stroke and cardiovascular disease in middle aged populations. Nearly 1.5 million Australians are employed in shift work. Health, performance and safety are often degraded in shift workers due to the combined effects of circadian rhythm misalignment and inadequate and poor sleep (resulting in disorders such as OSA, insomnia and shift work disorder). Insomnia is a very common disorder. In Australian populations 13%-33% of the adult population have regular difficulties in either getting to sleep or staying asleep. Chronic insomnia is best managed using non-drug strategies such as cognitive behaviour therapy or light therapy. However, if patients have ongoing symptoms there may be a role for adjunctive use of medication such as hypnotics. Delayed sleep phase disorder is a circadian rhythm sleep disorder most commonly seen in adolescents. It needs to be differentiated from insomnia. If imposing conventional wake times fails to resolve the phase delay, it may increase the risk of sleep loss which may lead to potential for adverse impact on academic performance, health and social functioning. Sleep disorders in children are common and include insufficient sleep, frequent night awakening and OSA. OSA in childhood has important implications for learning, behaviour and cardiovascular health. Many other sleep disorders are common in children, some which are a concern to the parent, but not necessarily potentially harmful to the child. Extrinsic factors can exacerbate poor sleep, such as use of social media (i.e. electronic devices) diet, timing of exercise, social events, depression and anxiety. Good sleep habits or sleep hygiene are behavioural practices that result in good sleep quality and sufficient sleep duration and prevent daytime sleepiness.